I do more agree with BB, I had to use fire department inspectors to push our contractors to fullfill what I consider to be a minimum requeriment even when the inspector never aked for it...totally agree with BB,....a well informed costumer ensure safety on any installation....sorry that this happen to Sundiego but is his installer still is making a living installing panels?....I just wonder how many Sundiegos out there ?.......good luck Sundiego. Hello everyone. I just found this thread and wanted to throw in my two cents. As far as this fire goes, I have never seen a solar module burn like that. From the pics of the array before and after, I would guess that the modules were defective or maybe made by other than a reputable company or possibly home made. Were they made in China or Taiwan? As another person posted, the modules should be vacuum sealed with a tempered glass covering. The solder strips should not be able to seperate from the silicon. If they were glass then it would be obvious in the pic after the fire. I would like to know the manufacturer of these modules. Do you have any pictures of the wiring from the panels through the DC disco and into the invereter? Or any pics of the array wiring before the fire? I do not think this has anything to do with the inspector. Did the inverter sustain any damage from this fire? Those inverters are pretty new to the market and may still have a problem here or there. Also, a system can be installed incorrectly and still work before it fails. I have repaired a few that worked fine for several years before failing. I cannot believe you all are being so diplomatic. 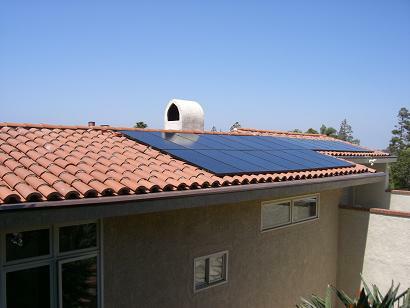 I do design and sales of PV systems in LA and OC counties and I cannot believe that P.O.S. was approved! We have been doing excellent work for many years and are still routinely dinged by inspectors for the most minor inspector-subjective issues. We would NEVER have sold our customer such OBVIOUSLY cheap (and probably un-listed) junk modules like those (did you get a rebate???). And we would NEVER have used such pitifully laughable mountings (from the local hardware store???) and mounting techniques. That system is so sub-standard I just can't believe it's in L.A. and not in Guanajuato! I hope you didn't pay more that $5/watt for that and I hope you didn't waste a lot people's time getting a real quotes from real contractors (especially us) before you went with the low-baller. You should drop all the nice talk and tell us who the module mfg is, who that supposed contractor is, and who that suppossed inspector is. That job is an abortion that never should have happened. If your house had burned down and taken you with it, our entire industry would suffer the consequences as the papers blared "solar cooks greenie in his bed!" I understand your horror at seeing this permitted and inspected installation. At this point, I would not be prepared to point at the original poster as being at fault. While the OP may have purchased based on minimum bid--if the contractor had a valid California Contractor's license and building permit/inspection from the City of Los Angeles--the OP would have done met the basic due-diligence that one would expect from a non-technical/not involved in the industry end user. On this board, we try to help and educate people--not unload on them for picking the wrong contractor. I have seen lots of issues with contractors--some with good reputations (and their businesses destroyed by divorce or drugs). And there are also quite a few fly-by-night folks out there. I do agree that the contractor should be criminally prosecuted and the OP was (up to this point) too nice to somebody that dam near killed the OP, family, and/or neighbors. We do believe in open and honest discussions here... And, if you wish to post some photographs of a few of your installations and descriptions of what to look for when searching for a good solar supplier--please, at least I (just a moderator that helps control spam here--I am not otherwise associated with NAWS/WindSun) would be very happy for you to create your own thread on this subject. This is a private discussion forum hosted and paid for by Northern Arizona Wind&Sun (solar RE wholesaler/retailer)--so outright ads are not allowed--but information about people that do solar RE well is welcomed. well said bill and the op certainly is aware of what almost happened and was willing to come here to inform others. it may not be in his best interest at this point to divulge particulars as i believe this may be legally actionable and we do want to know particulars when the time is right. Sorry if I sounded like I was unloading on the "OP", I guess I was. But remember that the purchaser is an integral part of the mix, not a bystander. How they approach and deal with the solar design, purchase and installation process has a huge affect. We installers deal with all kinds people from wonderful to horrible. They can make this business a joy or a nightmare and they do have a responsibility along with us for the final product. I have personally sold hundreds of systems and designed and dealt with people on hundreds more. IMHO the "OP" probably didn't wind up with that system through no fault of his own. If a purchaser does their due dilligence to do some research and get competing proposals, they will become educated on what the standards are. If they make their decision on low price alone, they will usually get what they pay for. Having said that, this purchaser is not the main one to blame. He has the problems to deal with, he got the short end. But the "contractor" and the "inspector" really should be held accountable. Those two are really responsible for a near tragedy and need serious reprimanding. 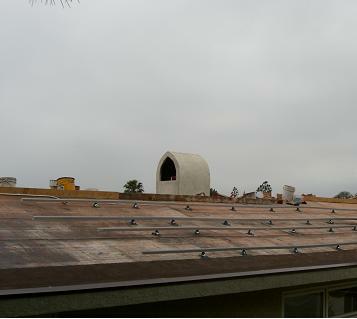 FYI: Here are three photos of a system properly installed inconjunction with a tile re-roof. A retrofit over composition would have the same or similar mountings. May people contact you via private message if they wish to talk with you about contractor installed Grid Tied Solar in the LA/Orange area? -Bill "speaking for myself--not affiliated with NAWS or WindSun other than as a moderator" B. Thanks for the offer but I don't want to spend more time on this issue and I'm really not trying to use this site to generate leads. We're on all the official lists or just google "solar los angeles county", you'll probably find us. As a program administrator for the California Solar Initiative (PV rebate program), we would be interested in following up with you once you have full details on your situation. That equipment, if it was the issue, is likely being used by other contractors as well. Once you feel you have the facts straight, please contact your local program administrator at www.gosolarcalifornia.ca.gov to discuss so we can help prevent what happened to you from happening to others. This is in addition to whatever you pursue with the CSLB, BBB, legal, criminal, etc. I know it sounds like a lot on your shoulders, but to grow a sustainable solar marketplace, this can not happen. Im also interested in receive info regarding brands involved in this case. In my opinion those cell connections are rubbish BUT are eyecatching ,so if your installer mounted 8 and didnt saw anything is laying. The structure is another " masterpiece ". Have seen no further info here, but one of the guys at homepower said they looked exactly like some of those home built panels like those ripoff DIY solar books that sell for $50 describe. i too have doubts, but he claims them to be 250w commercially made pvs and installed by an installer so some thoughts, theories, and questions i have in mind i will refrain on for now. i'm quite sure the local guys in official positions that posted their concerns here would have access to police and fire reports and it wouldn't be hard to find being this is a rare event with the involvement of pvs. Where in the world is Sundiego?......so far he has not provided any update to this thread since Feb/12/09.....I think this issue has been settle betwen installer and costumer. Sundiego has been logged in since his last post--but realistically, this could be months before he should say anything more given the legal issues involved. We will just have to wait and see... There is more than enough information here for people to see the differences between a "good" and a "bad" solar panel installation. SB, on your tile roof install, does the tile extend under the panels with cut outs for the mounts, or is the area under the panels the tar paper. If you have a question for him, you might try a PM (private message) to him. SB did not want to seem like he was trolling for business here on NAWS' forum--and he has not been back since his last posts. Others on this board can also probably help answer your question(s) to regarding the proper methods to install with a tile roof (sorry, not me). Wow! Lucky it was tiled roof and the fire contained at the panels. This is the reason to inspect/request all components for UL/CSA certified parts. I think the installer knew what he was doing. They probably settle with the OP to keep him quiet. If I were the OP, I would get the insurance involved first, they would secure the evidents to send to proper lab for analysis. Then the cause and who would be responsible for it would be determined. Also if the OP still monitors this, I wouldn't use that installer again, just take the settled money and go to a respectable ones. For those interested, this thread shows interesting mounting for these type of roof. Hope the local authorities notice this and closely watch that installer to prevent further mishaps like this. of some safety practices, rooted in reality, unlike the scam going on in Calif, where the local power moguls are writing city codes to ban panels on roofs because of firefighter access/danger. As people are saying, the modules look like home made or cheap modules not designed for installation on a property like this. I've seen a short caused by a pinched wire which immediately caused the insulation to catch fire. I think this is a short, not back feed or anything like that - the inverter would often have fuses to protect against any kind of overload, but who knows on this install. Regarding install on a tile roof, there are different ways. Prosolar makes a product called Tile Trac (sp? ), Unirac has hangar bolts, there are some other products, or you can remove the tiles in the area and put them over a comp shingle or other roof that easier - surround the area with tiles - and then it looks pretty good. It could get passed on inspection as the inspectors don't usually look to hard at the modules themselves or the mounting system, but if the modules are not CEC approved (this is in CA, right?) it would have problems with the rebate. edit: Pics didn't really look like a tile roof and pics of before and after looked kinda different too. here's a tile - not a reroof - where just the tiles where the standoffs were going were removed and then those tiles replaced with flashing. That's a pretty good synopsis. I have a little experience at this as I am in the process of getting our modules UL certified. First of all as stated the mounting is totally inadequate and amateurish. But the modules caught fire because the backing material was flammable otherwise there wouldn't have been a fire. These cells were layed on a piece of plastic and has silicone encapsulant poured over it. They would never pass certification and are only legal to use on off grid systems. In addition building codes don't allow use of non certified panels in the US. Now you know why. Last these are very large modules and even when built correctly they have problems with expansion and contraction. Tempered glass is used not only for impact resistance but also to make the whole laminate very rigid. The mounting caused the failure but they would have caught fire eventually anyway. Sorry for your loss. This is the reason the rest of us have to spend a lot of money getting certified because of morons that build modules like this. Obviously not acceptable solar modules. 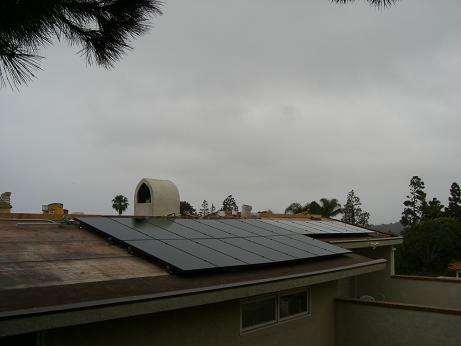 This install gives solar a black eye in that whole neighborhood and spreads to all their families and friends. Unless the "contractor" was the world's greatest liar, the homeowner here bears some responsibility for something, like going with a ridiculously low bid from a handyman. I am not going to go as far as blaming the homeowner... Assuming the facts are correct--this was a licensed contractor and fully building department permitted / inspected and approved in a major California city. And what if the bid was not rediculously low? More than a few "scam" contractors attempt to charge normal, or even excessive, prices in their normal course of work. I do agree that an educated consumer is an important part of the chain of value and safety--But I have yet to see a required course on consumer education (auto repair, hiring a contractor, DYI home repairs, let alone how to balance a check book or reading a credit card/loan agreement) after 12 years of basic education and 4 year technical college degree (and this was decades before the public education collapsed in the US). I saw an installation in my neighborhood today with what looks like these modules and racking. I don't know if I should knock on their door or not. Maybe if OP will post the manufacturer I could look at some more pics and really tell if they are the same. the op hasn't reared his head since my last birthday on may 6, 2009 and he never revealed who supposedly made those pvs. we are heavily leaning they were home-made. As was mentioned earlier, it's clear the cells were not bonded to a front glass with EVA as there would be no room for the tabbing to lift off. Interesting to note that though, as the tabbing would only melt the solder and lift off like that if there was a significant short-circuit, causing the copper to heat and expand. I've done a lot of failure analysis on electronics and I would guess that the substrate burned and then carbonized to the point of starting an arc. A VERY hi-current arc! I have seen 3V at 100 A start an arc in fiberglass circuit board material, that burns so ferociously you wouldn't believe it! If the backing for these panels was plastic, that could do it. As to water starting it...unlikely as rainwater is quite pure and non-conductive. On the other hand, if solder flux (corrosive type is rare these days of "no-clean flux") was left on the tabbing, and washed down the inside of the panel to the bottom cells, it could become quite conductive. But my better guess is a bad, overheated connection against plastic started this. UL94V0, required for these panels, does not allow self-maintained fire. Everything must self-extinguish. So I would guess (as many others have) home-made panels, or at the very least from an illigit mfgr. That's a real shame... What a horrible "trial by fire" for a solar newbie. They should string up the installer with several of his own panels :grr. Probably, much to the horror of a few of you, I'm posting elsewhere in a do-it-yourself thread, because I do believe there are ways to build your own....but only for ground-mount, off-grid apps using conventional panel materials and GLASS. Roof-top DIY is really WAY too dangerous. I doubt anyone here is horrified by DIY - most of the regulars here are DIY types. Unfortunately, there is so much hype from those selling individual cells, or DIY eBooks on how to "run your meter backwards" that there are quite a few people who end up here needing to have their bubble burst. Personally, I love the idea of rolling your own - I just try to make sure that the distinction between "hobbyist" and "commercial" is duly noted. And, as you've said, hobbyist PV modules have no place on a roof or on the grid. The arcing with solar panels tends to be the opposite of low voltage high current arcs... Basically 5-10 amps at a few hundreds volts DC... Makes for very stable arcs with easy ability to strike/re-strike an arc (aka DC arc welders are very nice too). Now battery banks... That is a whole different issue (1,000's or even 10,000's of amps available in the event of a dead short). I think he meant DIY/homemade panels - not DIY systems using UL certified products. I think most of the DIY installs we've seen are at least as good as the commercial installs. Yea, I know what he meant. I wouldn't bother building my own PV modules, but it doesn't horrify me that others would. After all, I'm a DIY type and have been known to bust out a soldering iron on occasion. Just yesterday I was hanging out with a buddy who was having a neon sign installed on his shop, and when the sign co. owner found out I was a journeyman he asked if I knew anything about solar. Turns out he had an idea about building some solar/battery/led signs but needed some guidance on the math. I even offered to give him a hand building a prototype. But I also told him that if he was going to actually install such a device on a building, he'd have to use some form of UL listed PV - eBay cells might be fine for a shop prototype, but never for a commercial sign.